Hijab pins are a nice way to add an accessory to your hijab without being too much. 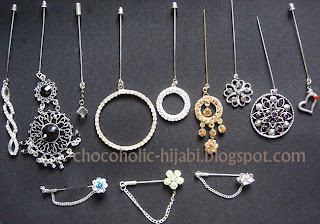 Hijab pins can range from simple stick pins, to fancy earrings that have been attached to a long pin. Here are a few pins in my collection. The gold one was an earring that I attached to an eyepin, after removing the earring post. 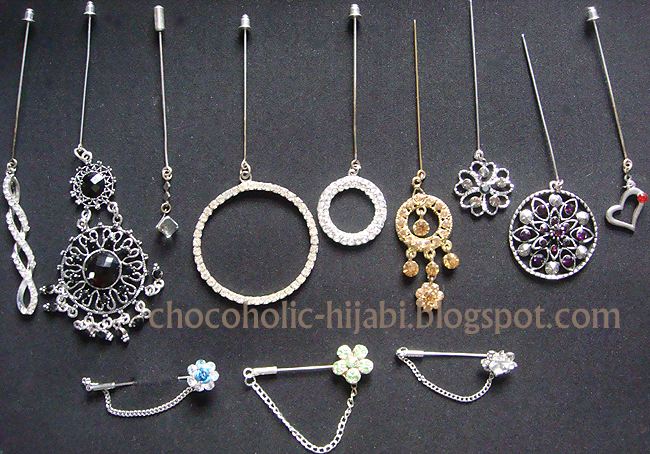 If you want to make your own hijab pins (or attach earrings to them), then you'll need eyepins. These pins have a loop on one side, (which is why they're called eye pins). The one's which are suitable for hijab pins have a sharp point, whereas eyepins that are used in jewellery making are not sharp. These pins may come with a pin cap, which covers the sharp point of the pin. I'm considering selling a few handmade hijab pins, which are made using 4mm Swarovski Bicone beads and are similar in style to the hijab pins at the bottom of the image. The beads are attached to the chain, which can be worn dangling from the pin, or draped from the other side of the pin. hey i was just wondering where u got the eyepins from? i cant find them anywhere and was hoping to make some for my cousins for eid!! plz help! !